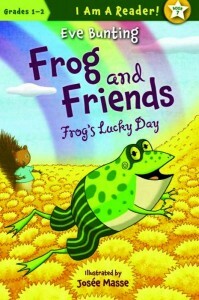 Frog and Friends: Frog’s Lucky Day by Eve Bunting is a great book. One look at the cover and I was hooked! The illustrations by Josee Masse are great. The bright colors and the happy green frog were interesting, and I wanted to know more. The layout and design is cheery and bright and correlates with each scene of the story. In other words, this is a delightful book from cover to cover. There are two stories in this book. In the first story called I See a Rainbow, Frog and his friends Rabbit, Mouse Possum, Raccoon, Chameleon and Squirrel, are amazed and elated to see a beautiful rainbow. 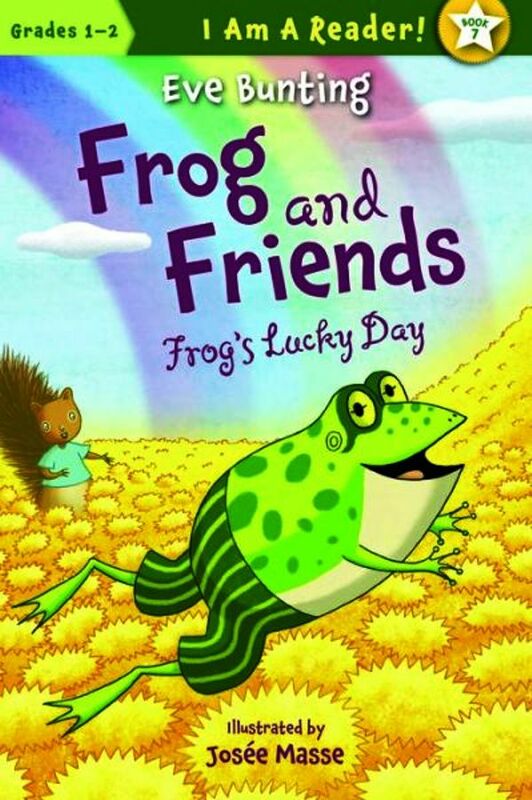 Mouse believes there is a pot of gold at the end of the rainbow so Frog and his friends decide to go on a field trip to see what’s actually at the end of the rainbow. Once there, they make a beautiful but unexpected discovery. In the second story called No Fishing, Frog is in distress because a fisherman has disturbed his peaceful home, leaving Frog unable to get any rest. Frog chooses to move, and with his friend’s help, he finds a new home. But Frog is very unhappy in his new home and doesn’t know what to do. I loved everything about this book, especially the indirect way that it teaches. The story incorporates the color indigo and introduces the animal friend called Chameleon, including a fun fact about chameleons. These are both things that are not frequently seen in early reader books. This is an ideal book for beginning readers in grades K-2. The stories are short enough to hold their interest, and the bold wording throughout helps them learn to read with inflection. Also, these stories are so interesting that children will want to read them over and over again. And as we all know, the more a child reads the better they become at it. I hope this review has helped you in deciding whether to purchase this book. As always everybody, Take the time, expand your mind, READ, READ, READ!!!! 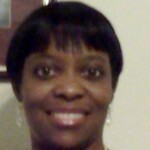 Hi, I’m Patricia Moore, but you can call me Ms. P. I’m currently pursuing a B.A. in English for Creative Writing. I’m a mother with two sons and one granddaughter. I’ve always liked reading and writing. I write children and adult stories. Thrillers are my favorite to read. Since my granddaughter came along, I have rediscovered how much I love children books and reading them to her. Completely animated with different voice and sounds, she loves it. I believe children books are important because they help to shape little minds.